For the first time ever, all nine mini-moves from the blockbuster animated comedies Despicable Me, Despicable Me 2, and Minions are available in one collection. Experience the hilarious hijinks when the Minions babysit their caveman boss's trouble-making toddler in Cro Minion, tune up Agnes's bicycle with high-tech upgrades in Training Wheels, and bring home a new "dog" in Puppy. This set includes six more uproarious mini-movies the who..
Own Despicable Me - Clown Mug from Deff, DVD, Blu-Ray & 4K Video Specialists - Free UK Delivery..
Own Despicable Me - It's So Fluffy Notebook from Deff, DVD, Blu-Ray & 4K Video Specialists - Free UK Delivery..
Despicable Me: Vying to be "World's Greatest Villain," Gru and his crew of hilarious Minions plot the crime of the century: steal the moon - but he meets his match when three little girls steal his heart. Despicable Me 2: Just as Gru has given up being a super-bad to be a super-dad, the Anti-Villain League recruits him and the Minions to track down a new criminal mastermind and save the world. Despicable Me 3: Faced with unemployment, i..
For the first time ever, all three blockbuster films in the Despicable Me franchise are available in one collection! The set includes all three record-breaking comedies - Despicable Me, Despicable Me 2, and Minions - as well as nine mini-movies featuring Gru, the mischievous Minions, and the rest of your favorite characters. Don't miss this amazing collection the whole family will love!.. For the first time ever, all three blockbuster films in the Despicable Me franchise are available in one collection! The set includes all three record breaking comedies-Despicable Me, Despicable Me 2, and Minions-as well as three mini-movies featuring Gru, the mischievous Minions, and the rest of your favorite characters. Don't miss this amazing collection the whole family will love!Special Features Includes 3 Mini Movies..
Despicable Me: In a happy suburban neighbourhood with its well-kept gardens and white picket fences, sits a black house with a dead lawn! This is the secret hideout of Gru (Steve Carell), who, with his army of excitable little yellow minions, plans to Take Over The World. Armed with his arsenal of shrink rays, freeze guns and battle-ready vehicles for land and air, Gru is accustomed to defeating all who stand in his way. But the arrival.. Double bill of animated features. In 'Despicable Me' (2010), trying to outdo his main rival Vector (voice of Jason Segel), serial villain Gru (Steve Carell) hatches a plan to steal the moon, aided by his army of genetically altered corn pops. About to set his dastardly plan in motion, and bristling with his arsenal of freeze-rays and sci-fi gadgetry, all goes according to plan until the arrival at his door of three little orphan girls, .. This blockbuster animated comedy from Illumination Entertainment sees the return of former super-villain Gru (Steve Carell), who has retired from a life of crime to raise his three daughters. But things take an unexpected turn when he is recruited by the Anti-Villain League to track down an elusive criminal who is threatening the world. Now, with new partner Lucy Wilde (Kristen Wiig) by his side, Gru and the Minions set off on an unpred..
Gru (Steve Carell), his adorable girls, and the mischievous Minions are back with a cast of unforgettable new characters in the blockbuster sequel to the worldwide phenomenon. Just as Gru has given up being super-bad to be a super-dad, the Anti-Villain League recruits him to track down a new criminal mastermind and save the world. 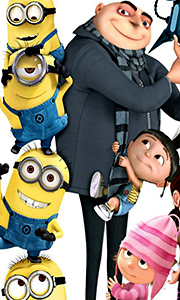 Partnered with secret agent Lucy Wilde (Kristen Wiig), Gru, along with the wildly unpredictable Minions, mu..
Illumination, who brought moviegoers Despicable Me, Despicable Me 2, and the biggest animated hit of 2015, Minions, continues the story of Gru, Lucy, their adorable daughters - Margo, Edith and Agnes - and the Minions in Despicable 3. After he is fired from the Anti-Villain League for failing to take down Balthazar Bratt, the latest bad guy to threaten humanity, Gru finds himself in the midst of a major identity crisis. But when a myste..
Illumination, who brought moviegoers Despicable Me, Despicable Me 2, and the biggest animated hit of 2015, Minions, continues the story of Gru, Lucy, their adorable daughters - Margo, Edith and Agnes-and the Minions in Despicable Me 3. After he is fired from the Anti-Villain League for falling to take down Balthazar Bratt, the latest bad guy to threaten humanity, Gru finds himself in the midst of a major identity crisis. But when a myst..
Illumination, who brought moviegoers Despicable Me, Despicable Me 2, and the biggest animated hit of 2015, Minions, continues the story of Gru, Lucy, their adorable daughters-Margo, Edith and Agnes-and the Minions in despicable Me 3. After he is fired from the Anti-Villain League for failing to take down Balthazar Bratt, the latest bad guy to threaten humanity, Gru finds himself in the midst of a major identity crisis. But when a myster.. In a happy suburban neighbourhood with its well-kept gardens and white picket fences, sits a black house with a dead lawn! This is the secret hideout of Gru (Steve Carell), who, with his army of excitable little yellow minions, plans to Take over the world. Armed with his arsenal of shrink rays, freeze guns and battle-ready vehicles for land and air, Gru is accustomed to defeating all who stand in his way. But the arrival of three littl.. In a happy suburban neighbourhood with its well-kept gardens and white picket fences, sits a black house with a dead lawn! This is the secret hideout of Gru (Steve Carell), who, with his army of excitable little yellow minions, plans to Take Over The World. Armed with his arsenal of shrink rays, freeze guns and battle ready vehicles for land and air, Gru is accustomed to defeating all who stand in his way. But the arrival of three littl..
Own Despicable Me DVD from Deff, DVD, Blu-Ray & 4K Video Specialists - Free UK Delivery..
7 mini-movies starring your favorite characters from Despicable Me, HOP, and Dr. Seuss' The Lorax come together for the first time ever in one exciting collection! Get busy with the Minions, hop along with Phil and Carlos, and explore nature with The Lorax in these hilarious crowd-pleasing adventures. It's animated fun the whole family can enjoy again and again!Home Makeover Orientation Day Banana Plus 3 Games Phil's Dance Party Wagon..
Pierre Coffin and Kyle Balda direct this feature-length spin-off and prequel to the 2010 hit 'Despicable Me'. Throughout history, and before Gru, the Minions have served many a despicable master, including Genghis Khan, Napoleon and Dracula. But having contributed to their masters' downfalls through a series of mishaps, the Minions find themselves living in Antarctica with no one to serve. A number of years pass and it isn't until 1968 .. Since the dawn of time, Minions have served (and accidentally eliminated) history's most despicable villains. After their latest explosive mistake leaves them without an evil leader, the Minions fall into a deep depression. With the tribe on the brink of collapse, three unlikely heroes-Kevin, Stuart, and Bob - embark on a journey to find a new big boss. When their quest leads them to their next potential master, Scarlett Overkill (Acade.. Since the dawn of time, Minions have served (and accidentally eliminated) history's most despicable villains. After their latest explosive mistake leaves them without an evil leader, the Minions fall into a deep depression. With the tribe on the brink of collapse, three unlikely heroes - Kevin, Stuart, and Bob - embark on a journey to find a new big boss. When their quest leads them to their next potential master, Scarlet Overkill (Acad..
Own Despciable Me 3 - I Love Lucky Mug from Deff, DVD, Blu-Ray & 4K Video Specialists - Free UK Delivery..
Own Despicable Me - Bello Mug from Deff, DVD, Blu-Ray & 4K Video Specialists - Free UK Delivery..
Own Despicable Me - Girder Mug from Deff, DVD, Blu-Ray & 4K Video Specialists - Free UK Delivery..
Own Despicable Me - Need Coffee Mug from Deff, DVD, Blu-Ray & 4K Video Specialists - Free UK Delivery..
Own Despicable Me - with Gru Mug from Deff, DVD, Blu-Ray & 4K Video Specialists - Free UK Delivery..
Own Despicable Me / Despicable Me 2 / Despicable Me 3 DVD from Deff, DVD, Blu-Ray & 4K Video Specialists - Free UK Delivery..
Own Despicable Me 3 - I Didn't Do It Mug from Deff, DVD, Blu-Ray & 4K Video Specialists - Free UK Delivery..
Own Despicable Me 3 - Line Up Mug from Deff, DVD, Blu-Ray & 4K Video Specialists - Free UK Delivery..
Own Despicable Me 3 - Unicorn Doodle Mug from Deff, DVD, Blu-Ray & 4K Video Specialists - Free UK Delivery..
Own Despicable Me 3 - Unicorns I Love them Mug from Deff, DVD, Blu-Ray & 4K Video Specialists - Free UK Delivery..
Own Despicable Me 3 - Yellow is the New Black Mug from Deff, DVD, Blu-Ray & 4K Video Specialists - Free UK Delivery..
Own Despicable Me 3 - You Feeling This Mug from Deff, DVD, Blu-Ray & 4K Video Specialists - Free UK Delivery..
Three shorts featuring the minions (voices of Pierre Coffin and Chris Renaud) of 'Despicable Me' (2010). In 'The Competition' (2015) the minions compete in a boxing match. In 'Cro Minion' (2015) two prehistoric minions babysit their boss' daughter. In 'Binky Nelson Unpacified' (2015) Walter and Madge Nelson (Michael Keaton and Allison Janney) pull off a daring robbery of a museum in New York. But trouble begins when they return home and..